Our Autumn Steam Spectacular will return for 2016 with a strong line up of visiting and home fleet locomotives including a Southern Region visitor. 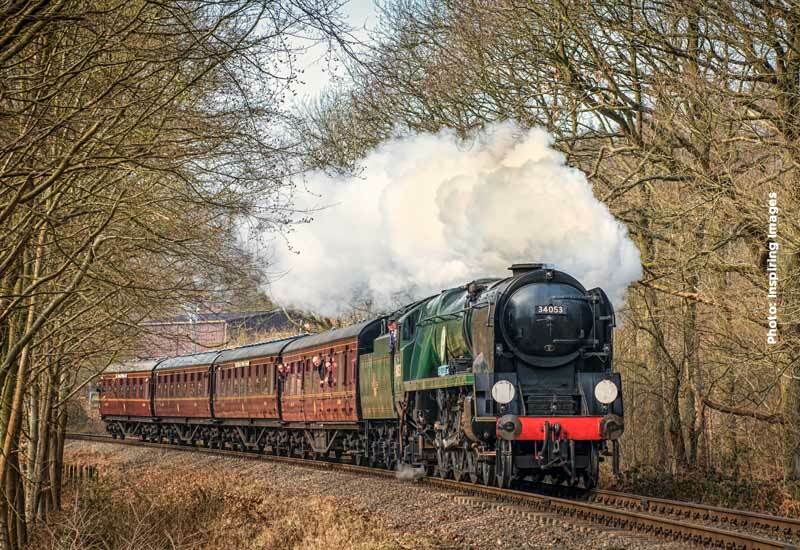 As usual we will be offering a great mix of photographic opportunities, passenger and goods trains, with non stop runs and double headers – a classic Worth Valley Steam Spectacular! British Railways Rebuilt Battle of Britain Pacific 34053 ‘Sir Keith Park’ from the Severn Valley Railway. With thanks to Southern Locomotives and Severn Valley Railway we are delighted to finally welcome Southern Region Rebuilt ‘Battle of Britain’ class 34053 ‘Sir Keith Park’ to the Railway, delayed nearly 18 months ago by road access restrictions. The Steam Spectacular provides a special atmosphere compared to the usual day to day life of the KWVR. We will re-create the hustle and bustle of a busy Steam Railway, with local services to and from Ingrow West, mixing with goods trains and express services, on which you can ride the length of the line without stopping. Come along and visit and you won’t be disappointed, whether you are an enthusiast or a young person just starting their adventure of steam we can promise you will have a day to remember. A first for a Steam Spectacular – A lavish Pullman Breakfast train using our two Southern Region Pullman vehicles alongside our visiting locomotives. Sit back and enjoy being served a full English breakfast, tea and toast, the perfect way to start the day. This service requires pre booking and is limited seating only. Price £39.95 including all day travel. Or £19.95 in addition to your Rover Ticket. Call 01535 645214 to reserve your place.